One of the most beloved characters to come out of Star Trek was pointy eared, green blooded Vulcan, Mr. Spock. Portrayed by Leonard Nimoy, Spock became the voice of reason in the original series. He was loved by many for his stoic portrayal, and the outsider that became the most trusted character in the Star Trek universe. Nimoy died last year, but his son Adam Nimoy has paid tribute to his legacy with the new documentary For the Love of Spock, which was financed through a successful Kickstarter campaign. 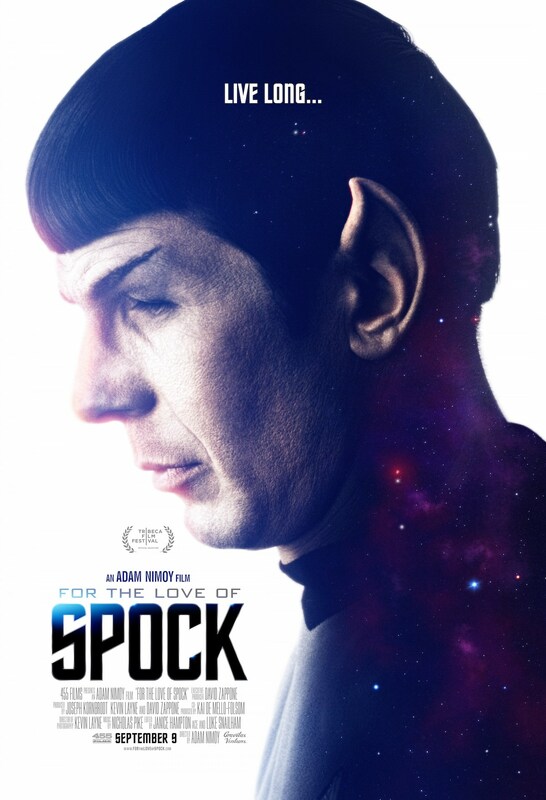 For the Love of Spock tells the story of two men, Leonard Nimoy and Mr. Spock. You have the actor, musician, photographer, filmmaker, and father who found himself defined by the fictional Spock. He felt the weight of the character that defined him. When you thought of Nimoy, you thought of Spock. Not the man who directed movie, the man who released albums or held art shows, displaying his photography. It was a heavy weight, but one he wore relatively well. As you’d expect from a documentary where the chief subject is one of pop culture’s great icons, For the Love of Spock features an impressive collection of people sharing stories, including Star Trek veterans like William Shatner, George Takei, Nichelle Nichols, Walter Koenig, J.J. Abrams, Simon Pegg, Karl Urban, Zoe Saldana and Zachary Quinto. We’re also treated to interviews with Nimoy before his passing, as well as family members, like his brother and sister-in-law, as well as step-son. The movie delved into the professional and the personal and highlighted a man who loved his family and his work. Yet It’s also an often painful examination of the rocky father/son relationship that existed between filmmaker Adam Nimoy and his father. Released to coincide with the 50th anniversary of Star Trek, the documentary was originally planned to focus specifically on Spock, but when Leonard Nimoy died in 2015, his son widened the scope to encompass the life of the man underneath the pointy ears. Leonard Nimoy narrates much of the documentary since a lot was filmed prior to his death, but the glimpses of home video footage, along with letters Nimoy wrote to his son Adam really exposed the heart behind the man. We get to see pictures, and listen to stories of how Nimoy moved from Boston to Los Angeles, and held various jobs as he pursued an acting career. Despite getting somewhat steady acting work, in which we see many clips from his early career, Nimoy supplemented his gigs with a wide array of jobs that highlighted his workaholic tendencies. Nimoy started acting in the 1950’s, but all the while he held jobs that paid the bills when acting couldn’t. For the Love of Spock highlighted the laundry list of jobs that helped Nimoy support his family, but at the same time fed into his need to always be doing something. He ran an ice cream parlor, had vending machines, drove a cab, serviced fish tanks and more, but it was an appearance in a 1965 episode of The Lieutenant that got Star Trek creator Gene Roddenberry’s attention. Roddenberry quipped that “He’d make a good alien,” and one week later Nimoy got a call to come in for an audition. The rest became history. The film also delved into the politics of Hollywood at the time. The first pilot for Star Trek failed to receive a pick up so Roddenberry went back to the drawing board, this time the only main cast member that made the cut was Nimoy’s Spock, much to the dismay of NBC.The network considered Spock cerebral as well as too “satanic looking” and feared he’d offend the Bible Belt viewers. Roddenberry stuck to his guns and the network agreed to pick up Star Trek. It became such a sensation that the cast quickly found obsessed fans, with Nimoy still having his name, address and phone number still listed in the phone book he would receive thousands of letters, as well as phone calls and people showing up at his house. Star Trek made him into a bona fide star. The film looked at Nimoy’s post Star Trek career as well, from Mission: Impossible to In Search Of fans are rewarded with insight into Nimoy’s feelings on the shows through own commentary about them. Nimoy’s directing career, which is often forgotten nowadays, is also celebrated. From Star Trek III and Star Trek IV: The Voyage Home, to the wildly popular Three Men and a Baby, it’s all there. So much of it is told through Nimoy’s own stories that at times you’d forget that he’s passed on. It feels like he’s sitting in the room next to you narrating what’s on screen. It did a wonderful job in spacing Leonard and Adam Nimoy’s stories. While For the Love of Spock is an entertaining and light-hearted look at the Leonard Nimony, as well as Mr. Spock, there’s also the story of a man sharing his thoughts on his recently deceased father. Whether it’s the good times or the rough times between the two, Adam Nimoy never let’s you forget that his father was a man, a man with a love for his friends and family. Adam Nimoy uses a powerful letter of explanation written by his father in 1973 to great effect, reading it in fragments throughout the film as a dramatic counterpoint. He also ends the film with a scene from 2015’s Burning Man festival as a celebration of Spock and Nimoy’s life. A sort of Viking funeral-esque goodbye. With the thousands of pictures of Nimoy and Spock plastered to a giant wooden sculptures, we get to watch it burn in the night with the ending credits rolling to the David Bowie hit Starman, played by Leonard Nimoy’s grandson. Overall, a fitting end to a fine film.